Acer has put its weight behind Microsoft’s Mixed Reality ecosystem, with the Taiwanese company's chairman, Jason Chen, estimating that the Mixed Reality market will reach 10 million units sold a year in the next few years, making it the largest platform for virtual reality. 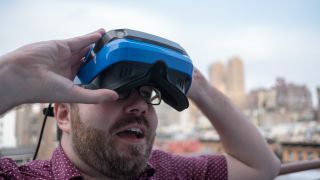 This is a bold claim, and Acer is looking to take advantage of the popularity of Mixed Reality with its Acer Mixed Reality Head-Mounted Display device. As we saw at IFA 2017, a number of other big names are releasing Mixed Reality headsets, including the Dell Visor, Lenovo Explorer and Asus Windows Mixed Reality Headset. Support for Mixed Reality headsets will arrive on PCs with Microsoft’s next major update of Windows 10 – the Fall Creators Update – which will be available to download on October 17, and many of the aforementioned Mixed Reality headsets will also go on sale on that date. That may even give manufacturers enough time to drop their prices further in time for Black Friday. While Mixed Reality headsets aren’t all-out virtual reality game devices like the HTC Vive and Oculus Rift, they will come with gaming features, such as SteamVR and Halo VR. It’s also been revealed that Acer is doing rather well on the gaming front, with its powerful gaming-ready laptops seeing a 61% increase in sales in the first half of 2017, gaming desktop sales rising 51% and gaming monitors up by a whopping 103%, as reported by DigiTimes. It’s little surprise, then, that Acer unveiled a host of gaming devices at IFA 2017, including the Acer Predator Orion 9000. With Acer going on a hiring spree to continue growth in this area, it’s likely that we'll see a lot more gaming products from the Taiwanese company in the future.